I started the bracelet kit I bought at the show on Friday and am progressing fairly well, but...at this point I refer you to the sidebar "about" column, and my expectation that I'm going to do everything perfectly first time. See why I'm less than happy with the bracelet? Might rip it out and redo - but not today. 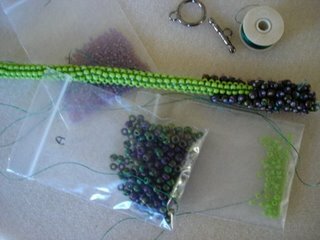 Any advice from beaders gratefully received - although I have unrealistic expectations of my ability, I'm not too proud to ask for help!